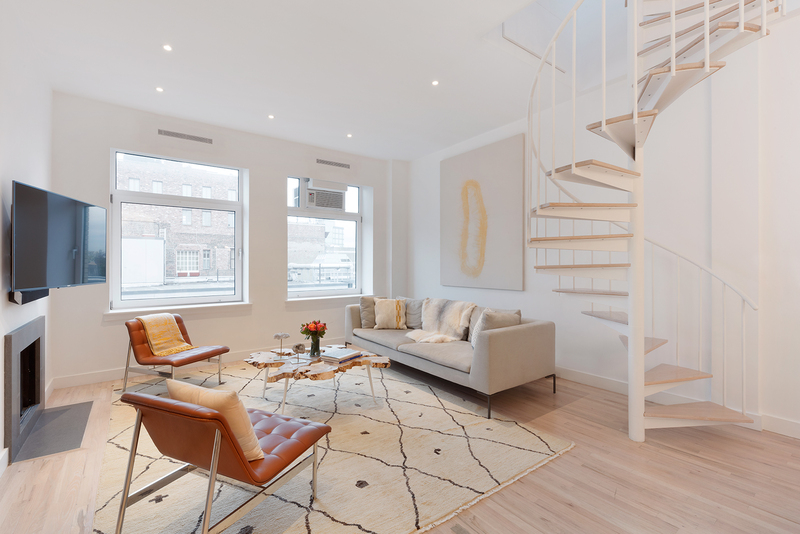 Penthouse 1124, is a bespoke residence created from the highest level of hand-picked materials and finishes resulting in a one-of-a-kind triplex punctuated by a gorgeous planted terrace overlooking Manhattan. This spectacular jewel box is the result of an 18 month collaboration between the immensely talented team at Present Architecture, the highly heralded landscape architects at Harrison Green and one of Manhattan’s finest boutique contractors. The apartment features 10.5-foot ceilings with significant northern light, gracious scale and remarkably comfortable living spaces. On the second floor, a large living room with a rare, wood-burning fireplace and views across midtown Manhattan, is adjoined by an office nook constructed with custom dyed Ash millwork that exists as both a functional work space and pleasant visual interlude between the living room and kitchen. The kitchen is bathed in honed Imperial Danby marble spread over generous countertops with more custom dyed Ash millwork cabinetry below and above the counters. The kitchen is complete with Miele, Wolf and Sub-Zero appliances. The luxurious finished palate continues to the bathrooms which are highlighted with honed Bianco Carrara Pisanino marble and Walnut millwork. The lowest level bathroom features a double vanity and large shower with bench seating. On the highest level of the apartment, a sun-flooded den/bedroom/bar/artist studio opens onto a spectacular planted terrace with remarkable views. Wrapped in Ipe wood, this fully irrigated oasis features a wall of mature ivy and a variety of seasonal and perennial plantings along with a fully integrated outdoor grill and serving station. 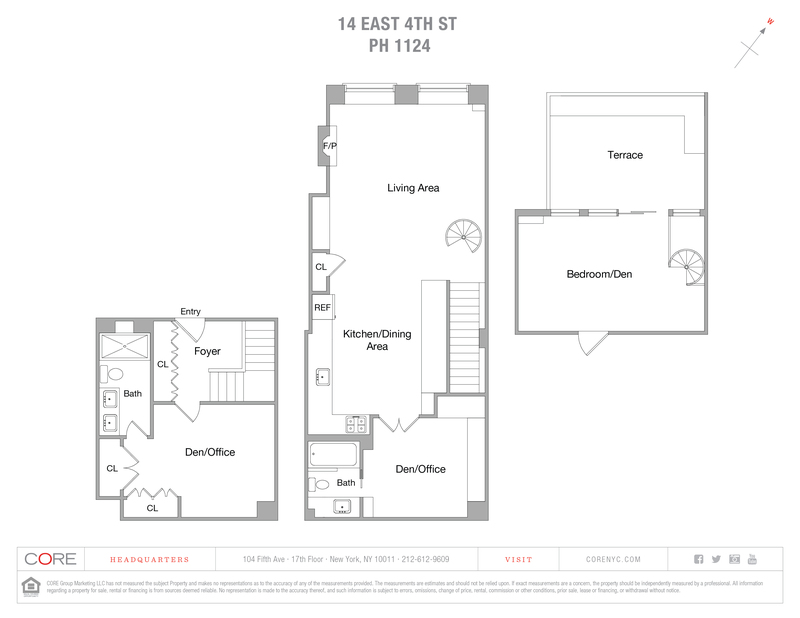 14 East 4th is a full-service condominium located in the heart of Noho, Manhattan’s most highly desirable and sought-after neighborhood. Surrounded by old and new restaurant and retail favorites like Il Buco, Acme, La Colombe, Bond Street Sushi, Honeybrains, Equinox and Soul Cycle to name a few.